In my previous posts on the subject, I looked at what traditional wood case pencils (or similar) I might consider for inclusion in a lightweight art kit taken on a hiking trip. If I want to include graphite, another option is to take a lead holder, either mechanical or clutch pencil. There are a LOT of lead holders out there. I have experience of just a few of them, but a warning- you will see below that I have a fondness for the Koh-I-Noor products for which I make no apology as they are invariably excellent. My Italian made Koh-I-Noor Tecnigraph 5611 may be the plastic bodied version of a classic introduced in 1956, but it is still giving great service twenty years after it was manufactured. It is very similar I feel to the lovely, equally reliable, Mars Technico from Staedtler that I carry every day for work. However neither of these clutch pencils, beloved by draughtsmen, are being considered for inclusion in my travel art kit. Each only weighs 13g, but, in my opinion, I show better alternatives below. Thin leads, in a variety of thicknesses up to 1mm, used in mechanical pencils, do not require sharpening. Such mechanical pencils enable tight, precise lines, great for detailed work though I am not sure I ever seem to have the time for this type of drawing when only briefly pausing while hiking. Probably the best, if expensive, mechanical pencil is the Rotring 800 0.7. Certainly it is a more reliable lead holder than the popular Pentel GraphGear 1000 that I have used for many years. But, in common with the GraphGear, the full size, well made, metal bodied mechanical pencil from Rotring is too heavy for a lightweight hiking set-up. I also think the Rotring is just too expensive to consider exposing to the rigours of the trail, there are excellent alternatives available for a more reasonable cost. As mentioned before, one of the most important things to consider on the trail is reliability. Mechanical pencils, by their very nature, have more things to go wrong. It is here that quality of manufacture shines through. I have been very careful over the years in noting when items have consistently failed on me, or become awkward to use. Favourites, either through aesthetics or sentimentality, such as with the Pentel GraphGear 1000, count for little when components fail at the most awkward of times. While still mechanical pencils, clutch pencils differ slightly in that the lead is not necessarily advanced on a click of the ‘knock’. Instead, when pressed down, the jaws open and close which grip the advanced lead stick. These are usually quite simple in design with little to go wrong, a distinct advantage on the trail. Lead sizes are substantially larger than the small diameters shown above. Instead, they vary from 2mm, comparable to the lead in a standard wood pencil, to around 5.6mm monster sized jumbo leads. 2mm is a pretty handy size of lead for clutch holders finding their way into an art kit for hiking. 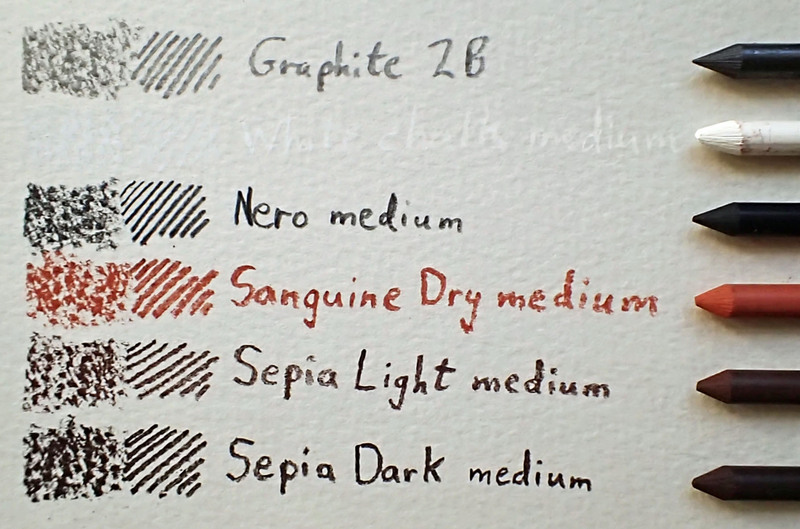 There is a lot of graphite in a single length and if not too soft it is possible to use a single lead for quite some time before requiring replacement. 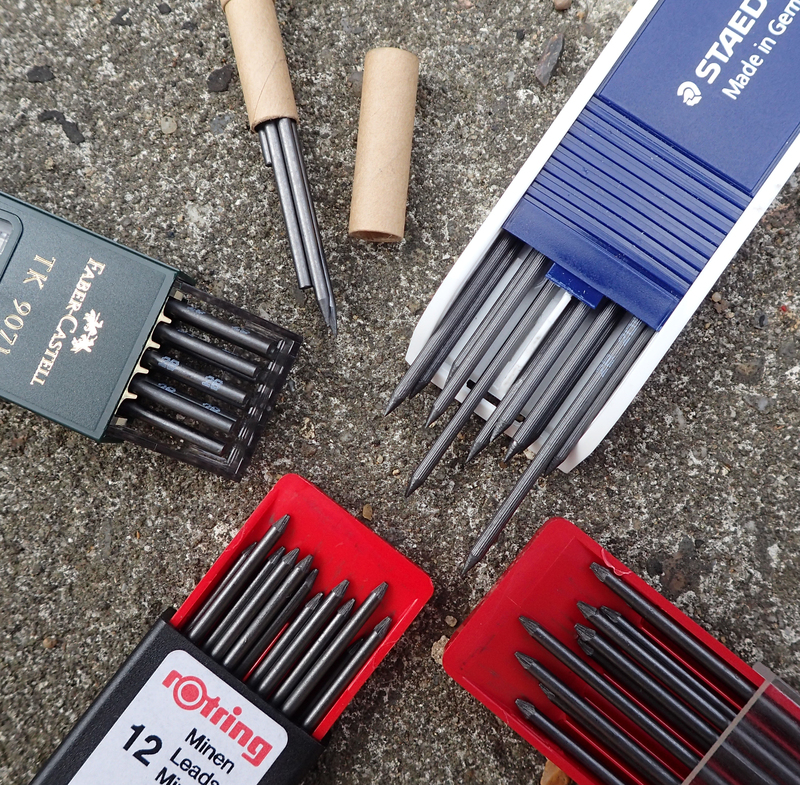 Clutch pencil ‘leads’ also require less sharpening than wood case pencils. How to carry spare leads without them breaking is another matter. While a clutch holder is heavier than a wood case pencil, it does mean that the balance and length of the holder remains a constant while the lead is used up. Short lengths of graphite can be held effectively in the jaws. Admittedly, there are elements of a clutch holder that can break or fail, in which case something purely minimalist such as the Penxo may suit. There is little to go wrong with a simple shaft of aluminium with a slot for a 2mm lead. But that fantastic looking, if not performing, product comes in at 17g which, while no means hefty, is still heavier or comparable to many of the holders looked at here with little gain. I do like the various lead holders produced by Koh-I-Noor. The 5900 and 5905 above, in particular, are lovely pencils. However Koh-I-Noor transfer their reliability of product to even their cheapest options. Just because a metal body is replaced by plastic, doesn’t mean that the internal components are compromised. So without compromising on reliability, I can look at slightly lighter options. Even the 12.2g ‘mini’ 5228 2mm clutch (below) has a top notch mechanism, an effective sharpener, removable pocket clip and is a great consideration for inclusion into any long hike kit list. Especially where a longer pencil may be problematic for some reason. The better made but slightly heavier (14.1g) 5608 notebook pencil is equally as good, also has a sharpener but does have just a couple of extra screw threads in the body that might loosen. The sharpener itself can work loose and is easily lost. Any of a range of 2mm leads of different hardness can be fitted as well as Koh-I-Noor’s small range of coloured leads (brown, yellow, green, red, blue, black), provided the diameter of these is within tolerance. Each of the mini pencils is intended to take 90mm leads which obviously do not last as long as the 120mm leads in the full size, 145mm long, pencils. Most of both short and long clutch pencils from Kol-I-Noor shown here have metal bodies, are very well made and utterly reliable. One problem with the shorter clutch pencils is just that, their shortness can feel slightly awkward in the hand. However this isn’t normally a problem with the brief sketches I am making in a trail journal. For longer sessions, a full size pencil is less tiresome, can be handled with more ease and can hold a 120mm lead compared to the standard 90mm lead in the shorties. Though I have managed to fit a 100mm length into these fairly well. The metal bodied Versatle 5201 and 5216 only differ in that one has a pocket clip and the other does not. 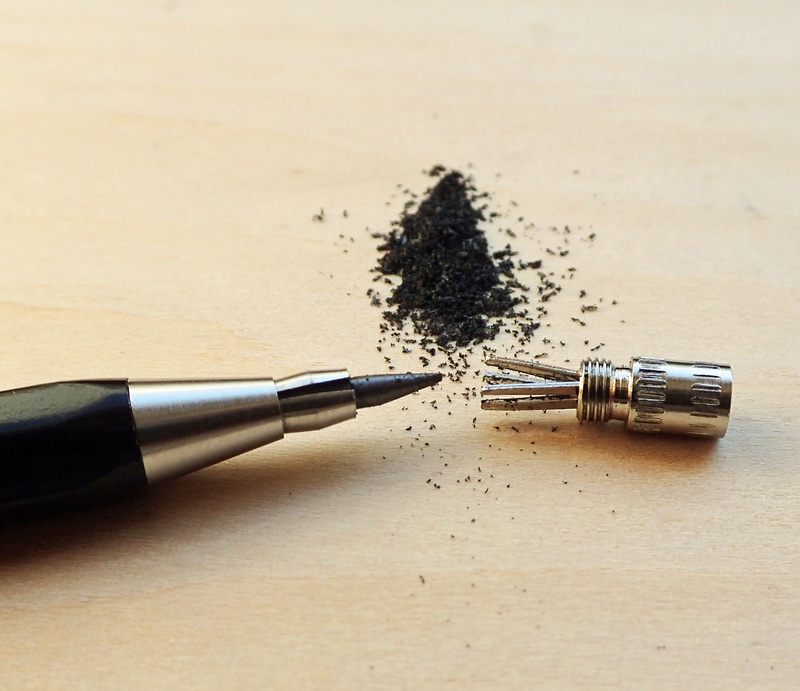 While most Koh-I-Noor clutch pencils have metal bodies, they do make a 2mm graphite holder with a plastic body. This is the Versatle 5211. Almost identical to the metal bodied Versatle 5201 and 5216 (no pocket clip) versions, with what appears to be identical internal metal parts, the 5211 weighs 10g (or 9g with the pocket clip removed) when loaded with a 120mm lead. There is a sharpener in the cap. This is a truly lightweight option and well worth considering. 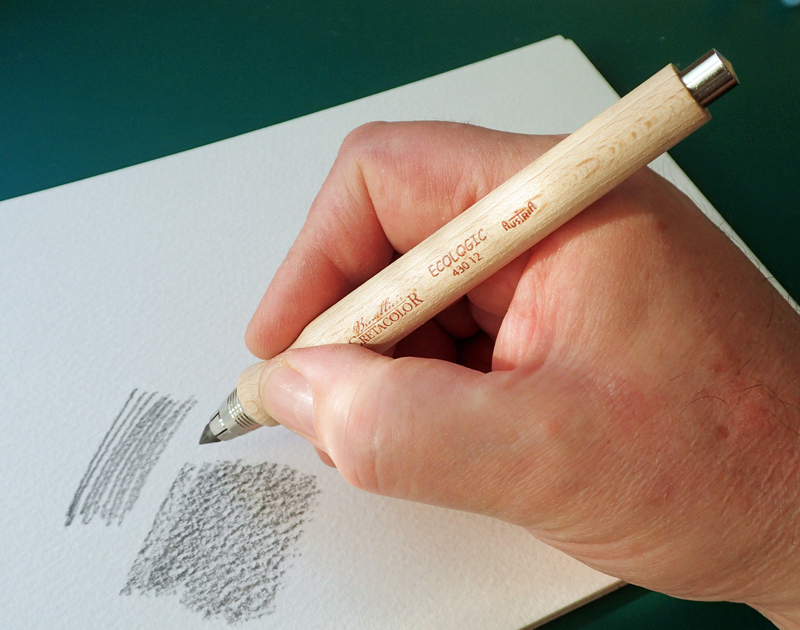 All of the clutch pencils above hold up to 2mm diameter graphite. There is also an uncommon offering, also made by Koh-I-Noor, that permits a still wider lead to be taken while still in a slim holder. This is the 5356 which holds 3.8mm graphite. It is no lightweight at 27g (including 90mm stick), it is very well made with all metal components, however no integral sharpener is included in its design. Replacement leads can be difficult to find and online ordering must invariably have to be relied on. No High Street shop is going to carry them, so possibly not the choice if expecting to restock en route. The smooth bodied holder is designed for coloured art leads but the short 60mm Pilot Crocus graphite leads fit. There is no sharpener, no pocket clip, no grips on the barrel. It looks simple and efficient, it is. If the idea of switching from a wood pencil to a hard, uncompromising metal or plastic boded alternative is anathema, there are still some wood bodied clutch pencils to be considered. Probably best amongst these is the lovely little, dumpy 5208 from Kol-I-Noor. It is 128m long and, again, sports a sweet little sharpener in the cap. The very light wood bodied 160mm offering from Kita-Boshi is actually made from recycled wood shavings, or sawdust, set into a resin. But you wouldn’t believe it look at and to handle it. It appears to be a very tough pencil as a result of its construction, has (what looks like) brass internal mechanism and a simple button knock. No sharpener is included in this pencil. Much as I am an analogue guy and really like these offerings. They all have disadvantages or aspects of construction that make me doubt their inclusion in my own lightweight, reliable, art kit for hiking with. The incredibly thick 5.6mm ‘leads’ held by the Cretacolor Ecologic enable quick and efficient shading, but still allow (not quite) fine lines to be drawn. The ergonomic wooden body has a pleasant, easy to hold waist. This lead holder is fairly bulky and, despite having a wooden body, isn’t as light as you might think, tipping digital scales at 31g of which 5g is the lead. But the clutch pencil is very well made and totally reliable with simple bush button top and six metal gripping jaws. This holder is made to last. 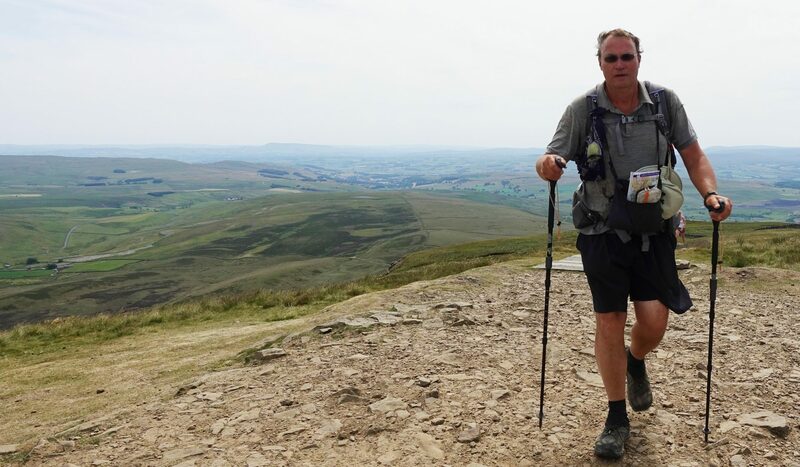 It would stand up to any rigours of the trail with ease. There are thirteen different leads for this clutch holder (or for other lead holders that take the same size) including a small coloured selection, however I only have a handful of them, shown below. Much as I like this holder, I don’t think it is particularly suited to the small format sketches I am usually producing on hikes. A great advantage of the clutch pencils is that they are a one-off purchase. All that is then required is a refill with any of the available replacement leads in whatever grade of hardness desired. The hard protective cases most of these come in are overkill for the trail and I simply slip a few leads into a plastic capped tube. I have a small sample from my favoured suppliers but as the BBC would say in the interests of impartiality- “other leads are available”. The ones I show here are more than sufficient to my needs. The one available from Kitaboshi is an especially dark offering, even darker than the Mars Carbon from Staedtler. Other favourites of mine amongst those shown are the Koh-I-Noor and Faber Castell leads as they are mid-grade, consistent and exhibit little grittiness. But in truth, they are all good products. The lead that I most frequently take on my travels is the Mitsubishi Uni 2mm graphite. I just wish this excellent lead was more easily found.